Building number 5 ticked off the list! It’s a small milestone, but if you think I won’t celebrate even the most minute achievement then you are sorely mistaken! This post also has the benefit of having a, somewhat tenuous, personal link for me, in that the most recent restoration of the building was carried out by the practice I work for although quite a while before I started working for them (it should be noted that the practice was brought onboard following the demolition of the main church building). 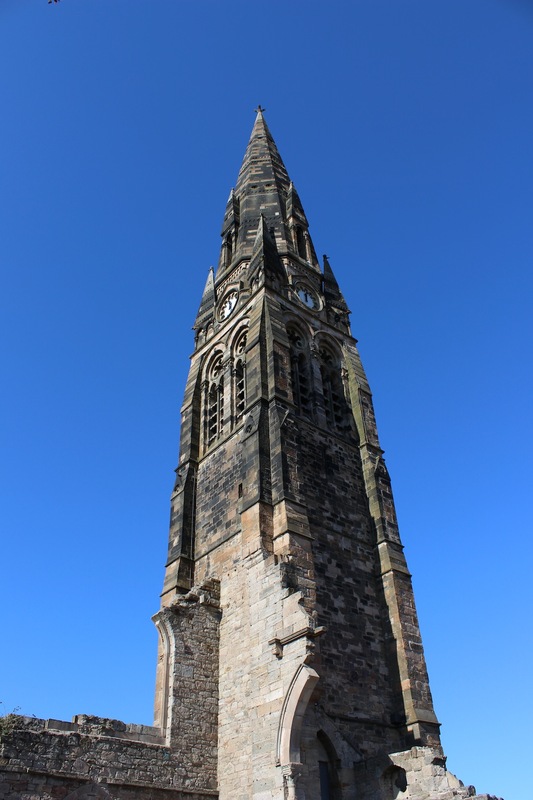 The Royston Spire (or Townhead Spire (or most correctly former Townhead and Blochairn Parish Church)) is all that remains of a now demolished 1866 church, designed by Campbell Douglas and Stevenson, with sculpture by John Mossman, interior design by Cottier and Co and stained glass by Morris and Co. The church was demolished in 1997 leaving only the spire after the council deemed it to be unsafe, although anecdotal evidence from those that had been inside prior to demolition suggests that whilst there was rot evident in localised areas, the building itself seemed structurally sound. The ScotlandsPlaces record for the site contains some interior images from 1996 that show that whilst almost all of the linings had been disrupted the core structure remained intact. 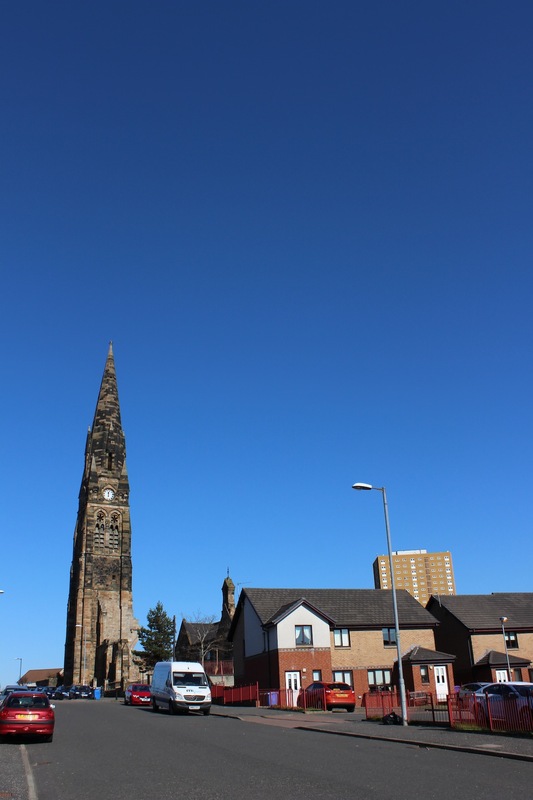 Following the demolition of the main building the Royston Spire and Park Project was formed in 1997 in attempt to prevent the planned razing of the highest spire in Glasgow. 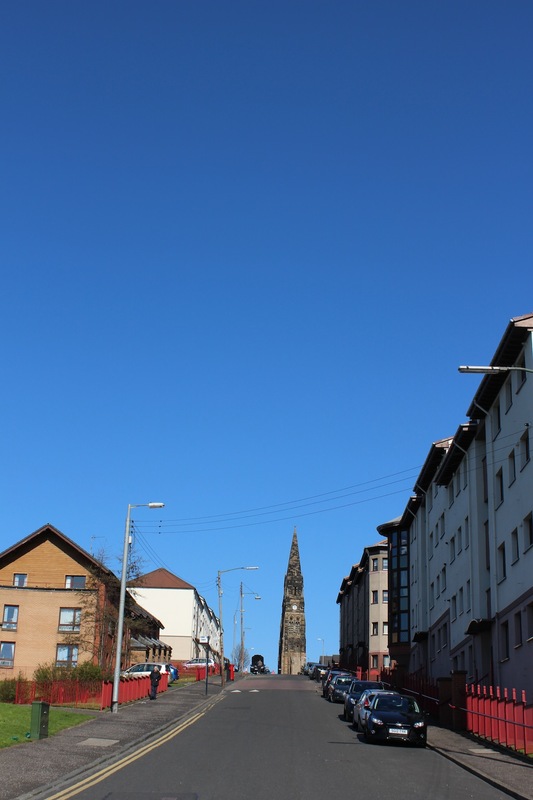 A public petition, as well as support from organisations such as Glasgow Building Preservation Trust, Glasgow City of Architecture 1999 and Historic Scotland meant that a stay of execution was granted, and subsequently that the spire was restored and lit. Despite the church being bulldozed, some elements of it were rescued. The stained glass in the southern elevation of the church was designed by William Morris, notable for his association with the Arts and Crafts movement, in collaboration with Edward Burne-Jones and Ford Madox Brown (a photograph by Catherine Houston shows the windows in-situ). These windows represent Morris’s earliest work in Glasgow by almost 30 years and were thankfully removed prior to the demolition and are now kept in storage by Glasgow Museums at the Burrell Collection. The stone heads carved by John Mossman were also saved, although their condition was very poor, and these were installed in the park at the base of the spire (you can spot them in this archive photo above each of the cast iron columns in the arcade’s spandrels). Sadly however, by the time of the demolition the archive photos show that the Daniel Cottier designed interior had so badly deteriorated that there was little of that to save. The tall, square spire is simple at the base with only perpendicular buttresses, arrowslits and string courses providing any articulation. The fourth storey sees twinned, rounded and louvred lancets introduced to each elevation with simple placte tracery to the spandrel. Rising further clock faces are recessed into each facade, whilst pinnacles are introduced at the four corners of the tower from which the octagonal tip of the spire emerges. The pinnacles have paired gothic arches to each face, whilst barely perceptible gargoyles stand watch at their outermost edge. Four tall lucarnes with single gothic arches are centred on each of the elevations drawing the eye further skywards, past two lines of punched out quatrefoils, till you reach the recently replaced finial. 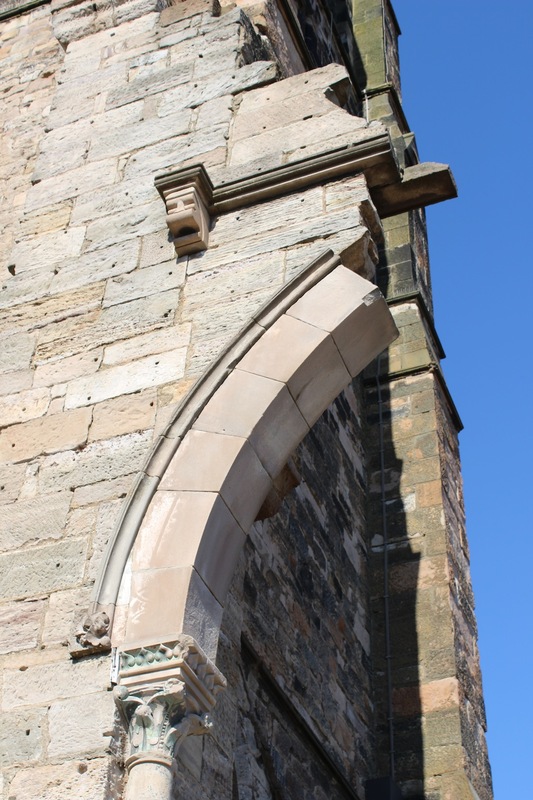 Remnants of the church also remain around the base of the tower; a segment of the first arch of the interior arcade, a pair of arched windows and the square-headed entrance portals contained within gothic arches. These form part of the boundary for the Spire park, which was opened in 2001 and designed by Loci Design in collaboration with Graham Fagen and Toby Paterson. The Historic Scotland listing for the building makes for rather sad reading given that the listing still describes the church in its entirety, however for those wishing to know more about the complete design it provides a comprehensive description to complement the previously linked archive photographs. Whilst the demolition of the church has been a great loss, the saving of the spire is a great achievement for the local community who came together in support of one of the few historic buildings in their area, and one that is of great significance to many whose families have grown up around it. As part of the wider city, the spire’s dominant position atop the Garngadhill means that it is a prominent landmark for the north of the city and is particularly visible from the motorway. 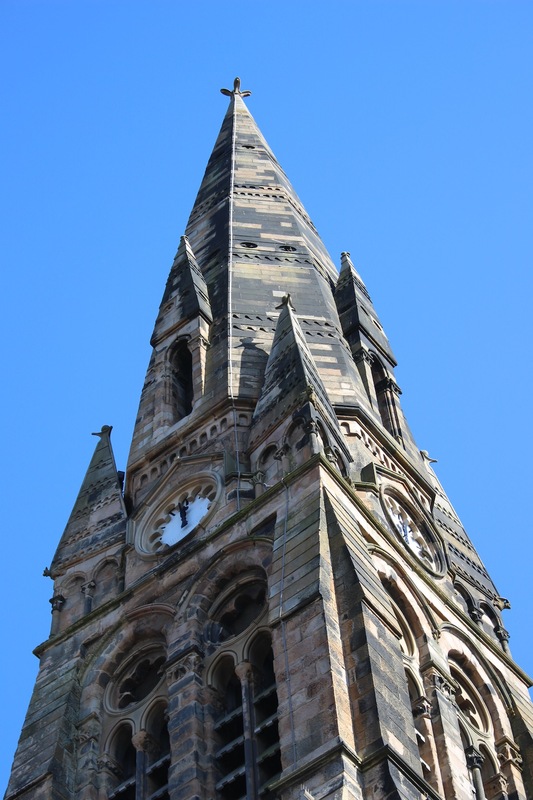 In recognition of this the Glasgow Institute of Architects are running a competition to celebrate the 150th birthday of the spire and are looking for submissions of proposals for lighting the tower and also making it more accessible. Although the spire was lit for the 1999 City of Architecture celebrations and the fittings are still in place, the correspondence I found in the office archives seems to suggest they were a magnet for pigeon guano, which might suggest a cause for the current lack of illumination! You can find out all the information you need to enter the competition here and the GIA will post images of the shortlisted and winning entries on their site after the competition period is over.